1 Cooking Lomi can be quite challenging but with these easy to do steps, you’ll have Beef Lomi in no time! 2 Begin by getting your pan nice and hot over medium heat. Pour some oil and throw in the onion, garlic and half of the bell peppers. 3 Gently add the rice wine and beef and just stir for a minute. 4 Add water and Knorr Beef Cube and give this a nice boil then reduce heat and simmer. Using a slotted spoon, skim off any impurities that rise to the surface. 5 We’re almost there! You just need to add the flavourings like the soy sauce and oyster sauce next before adding the lomi noodles and flour mixture. Finally, stir in the cabbage, spring onions, and sesame oil and that’s it! Our Beef Lomi is ready for the taking. Just top it with chopped spring onions and bell peppers. 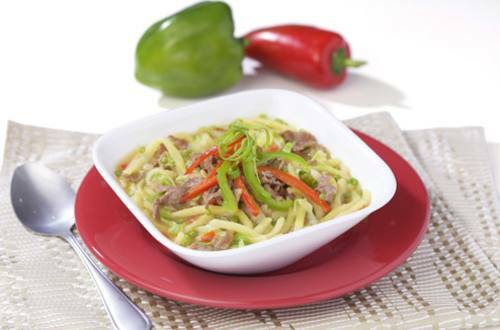 6 Your life will never be the same again once you try this Beef Lomi Recipe. It will definitely not disappoint!